In fact, there are many professional agenda templates that you can download for free. Moreover, each template is suitable for your needs, so there is no reason not to issue an agenda prior to a meeting. The following are the best agenda templates that you can use. A meeting must have an agenda. People need to know what they will be discussing in a meeting before the event starts. 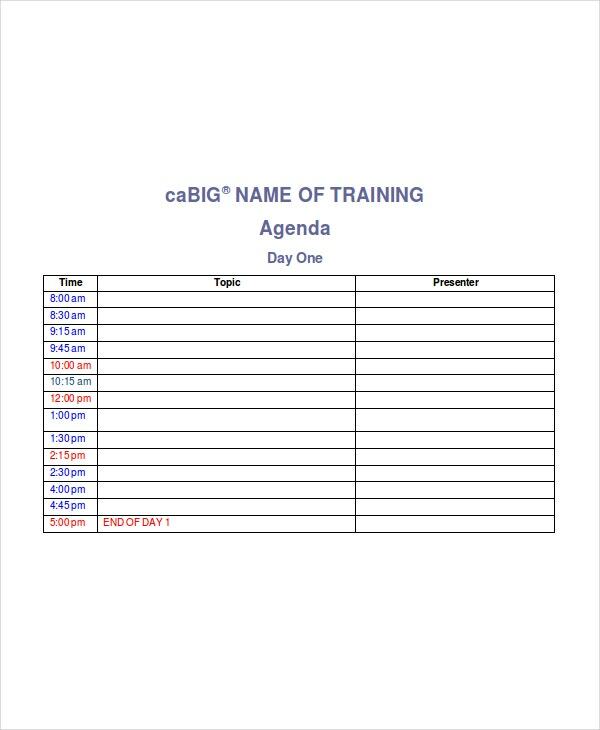 Tips To write an agenda, use the professional meeting agenda template. Before you call a business meeting to discuss any matter concerning development, you must write a comprehensive development agenda. You can use the development agenda template to do the writing. A training agenda gives a comprehensive overview of the kind of training to expect. By using this template to prepare your agenda, you will not only save time but also keep the concerned parties informed. 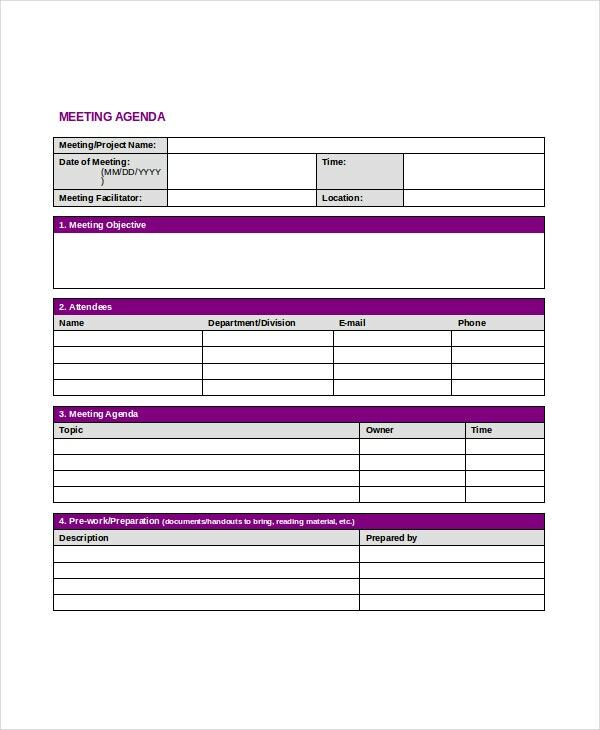 A professional agenda template helps you to write a meeting agenda within the shortest time possible. 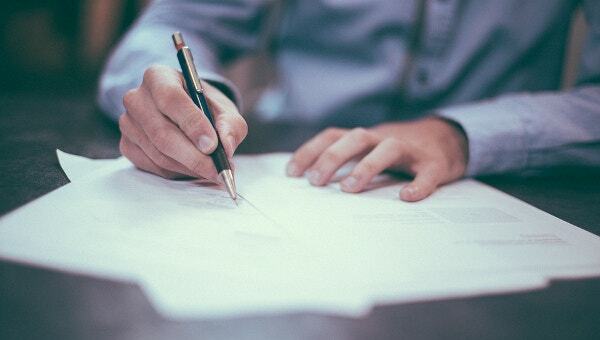 After you download the 100% editable, customizable template, you can be sure that you will spend less time writing the agenda than you would if you created the template from scratch. You can also see planning agenda templates. There are different agenda templates for different purposes. For example, a training agenda template is different from a business agenda template in the sense that they have different focuses. That means there is likely a template suitable for your needs. A business meeting without an agenda is totally useless. There is no way the meeting will start and end successfully if those in attendance have no idea what the meeting is all about. Conferences are big meetings that can last for many days. Such meetings need comprehensive agendas that must be presented in writing. 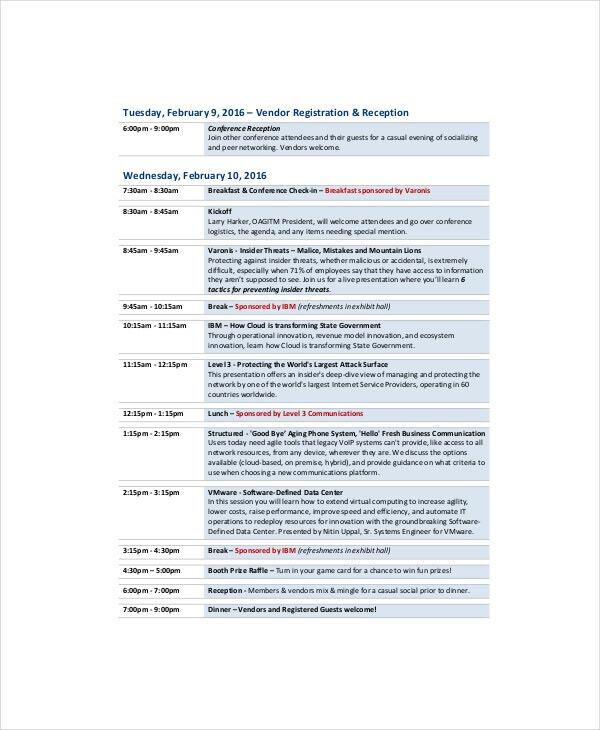 Use this template to write a comprehensive, focused agenda for your conference. Personal trainers who provide training services can call his or her clients for a training meeting by issuing a training agenda to each one. The trainer can send the agenda through e-mail or by direct issuance. Business executives can use the event agenda templates to inform the target staff team about an upcoming meeting. 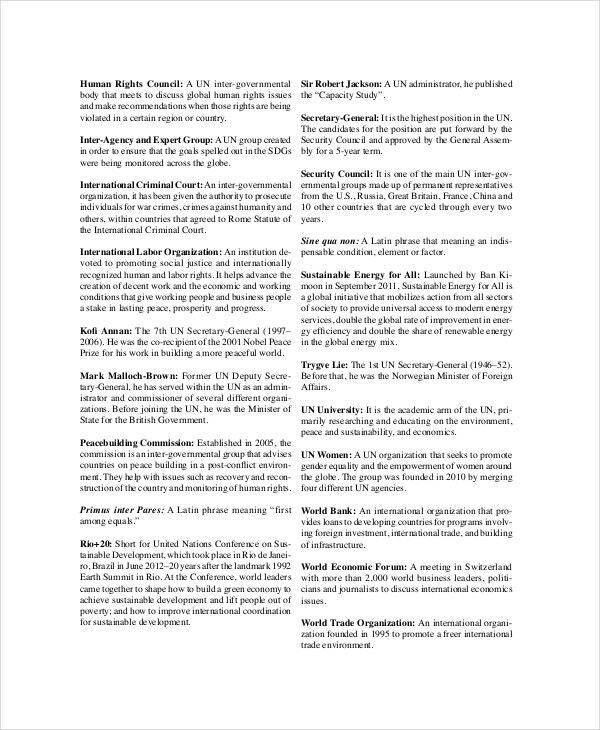 The expected attendees can read the agenda before the meeting and be informed about the topics of discussion before the meeting begins. 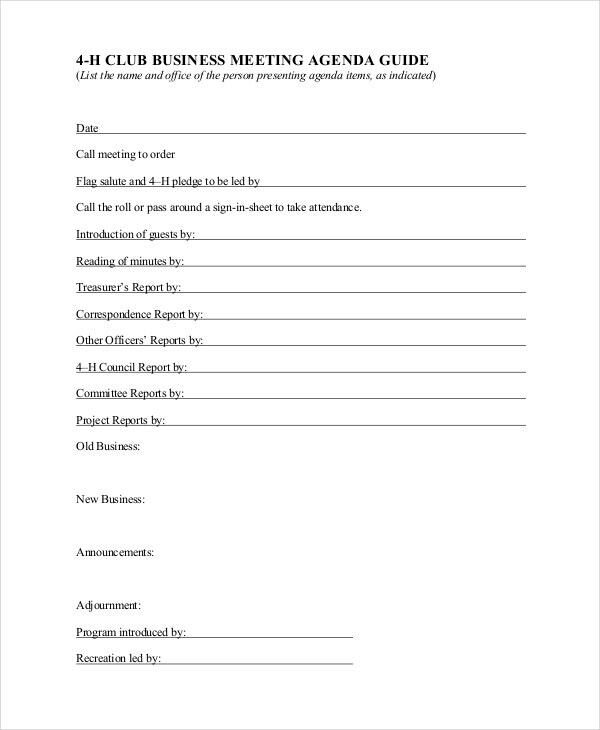 Business developers who call business meetings will also find the agenda templates useful as well as our conference agenda templates. The need to call a meeting always raises the question of an agenda. People always want to know about a meeting before attending. We know for a fact that a gathering without goals almost always has no purpose at all. They are boring, annoying, and inconveniencing too. The only best way to ensure a meeting flows smoothly is to keep everybody informed. That means your team must know what you will be talking about in a meeting before calling the gathering. It does not matter how long a meeting will take. Understand this: a meeting is a meeting, and it does not matter how long it takes. Every gathering, whether it is a five-minute meeting or a two-hour gathering, must have an agenda.